Screen shot of the NW Chocolate Festival Site. visit www.nwchocolate.com for the chocolaty details. 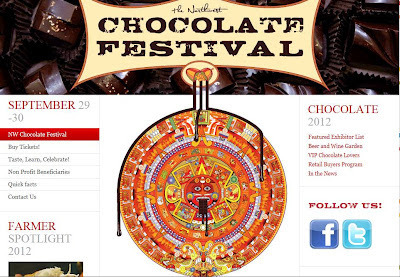 Want a free ticket to the NW Chocolate Festival? Here is your chance. The NW Chocolate Festival needs volunteers to guard chocolate displays and presentations (Clay Gordon will be making chocolate from bean to bar in person all day), direct hungry chocolate lovers toward the chocolate samples that they love (always tons of chocolate samples at this festival) , and perform various other volunteer activities on September 29 and 30 at the Washington State Convention Center in Seattle. Save the $25 that you would spend on a ticket and get the inside scoop that only a volunteer can see! I'll be there every minute that the festival is open, both days. Hope to see you there!! P.S. I will be looking for at least one very special volunteer to write a blog post about. Interested? Let me know before the festival. So glad you posted this! I was wondering when the festival was going to be.